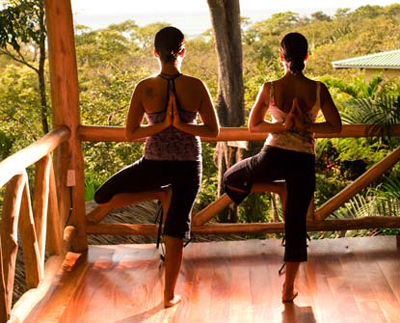 In Costa Rica Villa Cortes is an exclusive retreat center where you can go for a family getaway, arrange private weddings, enjoy yoga and surfing. From the native Cortes tree, which have an amazing yellow flower and prevalent throughout the area, the name ‘Cortes’ comes. 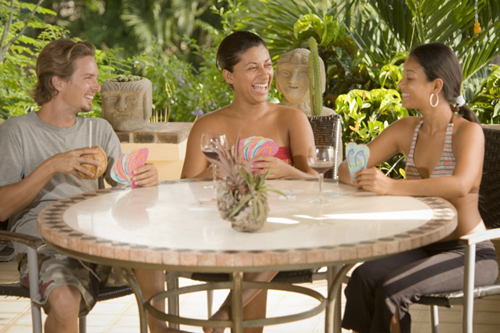 If you are looking for a group vacation you can go with up to 17 people traveling on the retreat center. While staying at the center, you will enjoy eating tropical fruits, watching beautiful birds and monkeys and also enjoy the fragrance of flowers that surround the retreat center. Villa Cortes Retreat Center is located above the Pacific Ocean on the Northwest Coast of the Guanacaste region, the town of Nosara on Playa Guiones in Costa Rica. This ocean is famous for its amazing sunset view and reliable year-round surf. There is a open-air multipurpose outdoor pavilion with 400 square foot, in Villa Cortes Retreat. This pavilion is made from local exotic hardwood and it is high above the pool and gardens. In this space you can easily be relaxed and refreshed by practicing Yoga or meditation and while doing these workouts you will also enjoy the lovely ocean view. If you go outside the gates of Villa Cortes, you can go to the beach and enjoy surfing. In the middle of the Villa Cortes retreat center, there is a stunning 20meter long edge lap pool which is surrounded by different types of flowering plants and lush gardens and also an elevated recirculating waterfall which makes the garden more attractive and beautiful. At Villa Cortes, the garden are highlighted with manicured walkways. There are beautiful stone statues in the gardens. There are many kinds of plants including bromeliads, gingers, orchids, heliconias, crotons, bamboo, coconut palms, papaya, herbs etc. 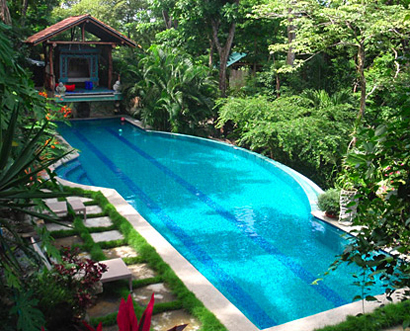 In Villa Cortes you will find three colorful houses which are available for rent individually or with a group. Casa Grande is the largest house with festive decor which has two private porches surrounded by beautiful gardens and wildlife. If you go with a large group then this house will be perfect for you. Through the large glass of the master bed room you will see monkeys playing in the mango trees. Casa Grande include two types of bathroom one is with shower and another is the two-person tub.After enjoying surfing you will obviously want to enjoy soaking in the two-person tub. There is also outdoor shower. There are 4 twins (or two king-sized beds), 2 sets bunk beds, 1 day bed, two private porches, full kitchen, Wi-Fi,TV, air conditioning, grill, and also ceiling fans. 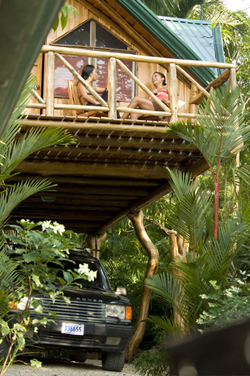 Arround a coconut palm tree, Casa Arriba is built which has a very warm and natural feeling. This is decorated with colorful bedding and an open floor plan. From the elevated porch you will be able to enjoy ocean and garden views. Casa Arriba includes 3 beds- 1 full, 1 single and 1 daybed. Casa Arriba includes all the facilities like Casa Grande. 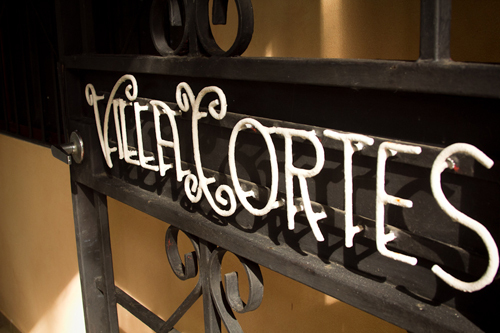 Casa Cortes is the original house of Villa Cortes which has an open floor plan, large kitchen. You can get some relaxing time in the chaise in the breezeway provides gorgeous views of the pool, waterfall and gardens. You can also enjoy great sunset view. In Casa Cortes there are 4 beds – 1 king, 1 single, 1 sofa bed (single). It has all the facilities you need for comfort.